When I knit something this pleasing, as I have been this week, I can’t help but appreciate the wonder that is a simple knitted stitch. Slip, slip, knit. Yarn over. Knit. My hands move rhythmically, my heart beats along. I’m comfortable, and at home. Knit, yarn over, knit two together. How is it that these small movements, like a dance of my fingers, create such a lively fabric? The Tilting Block shawl grows, though slowly, because I decided to start over. It was too wide, and would not have been as long as I’d like. I eliminated one repeat and I’m happy now. Every moment I can give to its knitting is a moment of happiness and calm and … wonder. WONDERful, Jane. The shawl, the words…Even though I’ve only been knitting a few years, the magic that hands and needles can create together is always amazing . You captured knitting perfectly.Just WONDERfully. You are Wonderful! Oh Jane. I feel the same way about knitting. 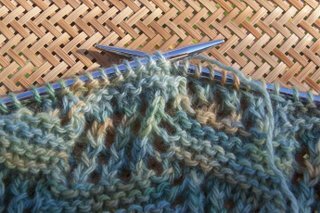 Have you ever really looked at garter stitch? oh. It’s so beautiful. Aren’t we lucky to be knitters? I just wish New Yawk was closer. how far did you get before you decided to start over – it was looking so wonderful at the circle the other night. But I know it looks just as fantastic now. It is going to be such a marvelous shawl and that yarn is perfect for it. Beautiful pic of your watery beautiful knitting. Hey Jane, Happy Thanksgiving! Having made your acquaintance this last year through your blog is something I am truly thankful for. I salute you! That is a very beautiful shawl. And the colors are like the ones you find on barn swallows just not quite as intense. Altogether lovely! Thanks for blogging, Jane. Always a pleasure to stop in to see what you are up to.